Our Sun holiday to Giardini Naxos is in one of the most picturesque resorts of the eastern coast of Sicily. Our 4★ beachfront hotel is the perfect base to flavour the sights and sounds of this stunning Italian island with mix of relaxation. We are based in the lively seaside resort of Giardini Naxos, at the foot of Taormina. The resort has grown from a quiet fishing village into a busy town, mostly due to its prime location overlooking the mighty Mount Etna. The main activity revolves around the relaxing seafront with several lidos providing easy access to the beach. The harbour is the place to go for cafes and a number of seafood restaurants, and in the evening many of the bars stay open late. Our hotel is ideally located by the pebbly beach. Here we can spend our days relaxing on one of the hired sun loungers and sip a refreshing drink. When we are feeling peckish there are a number of restaurants to satisfy our hunger. Alternatively we can spend our days by one of the swimming pools that the hotel has to offer, one of which is Olympic sized, the choice is truly ours. Sicily is the largest island in the Mediterranean, and it offers more than just the beaches and hotel pools. 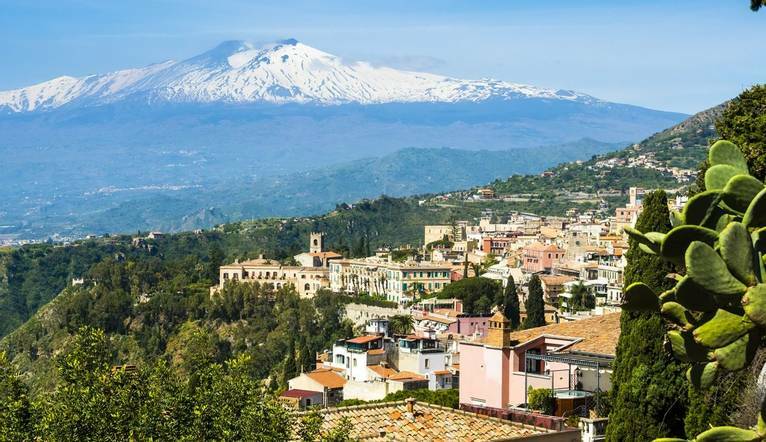 A trip here would not be complete without visiting the beautiful Mount Etna. Going up is a spectacular journey as the mountain’s landscape constantly changes. Another must see is Taormina which lies on a terrace of Monte Tauro in a fabulous position overlooking the sea, right opposite Mount Etna. A visit to the famous Greek Theatre which dates back to the 3rd Century BC is a must; the views of Etna are spectacular so don’t forget your camera!